APA recognizes that professional planners are uniquely qualified to provide leadership in defining, analyzing, and debating the issues of Smart Cities, particularly as it relates to placed-based strategies. The term "Smart City" has been around since the 1990s, and while definitions and applications vary, common elements among them are that Smart Cities use information and technology to engage citizens, deliver city services, and enhance urban systems. The use of Smart City technologies results in cost efficiencies, resilient infrastructure, and an improved urban experience. Technology is increasingly playing an integral role in how we plan, build, and serve our communities, and this October 2017 webinar highlights those making the most of it. Hear how three projects — all 2017 APA Technology Division Smart Cities Award winners — have realized innovative achievements by integrating Smart City applications, technological tools, and methods into the planning process. Learn how to address challenges you might encounter in your own communities and come away inspired with your own vision for a "smarter" city. View the webinar and earn CM credit. An Introduction to Smart Cities presentation, delivered by Matt Bucchin, AICP, LEED Green Associate, at the 2016 APA Texas Chapter Conference, provides an overview of Smart Cities trends, identifies best practices, and highlights opportunities for planners and the profession. Co-sponsored by the Divisions Council and the Student Representatives Council, the Smart Cities Student Design Competition invited interdisciplinary student teams to apply place-based Smart City technologies to a specific New York City site. The winning team, L.E.A.P. from the University of Illinois at Urbana-Champain, creatively identified a four-part vision — L.E.A.P. 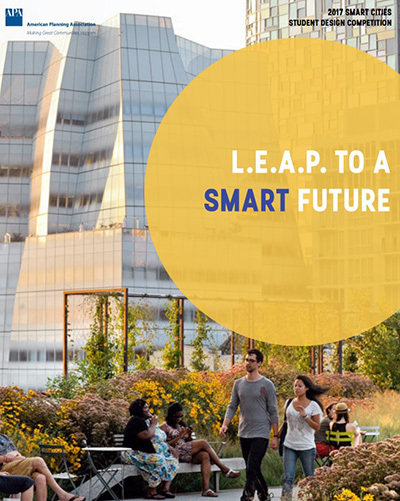 to a Smart Future — detailing how Smart City technologies could be used to improve Livability, Empowerment, Accessibility, and Play on site. 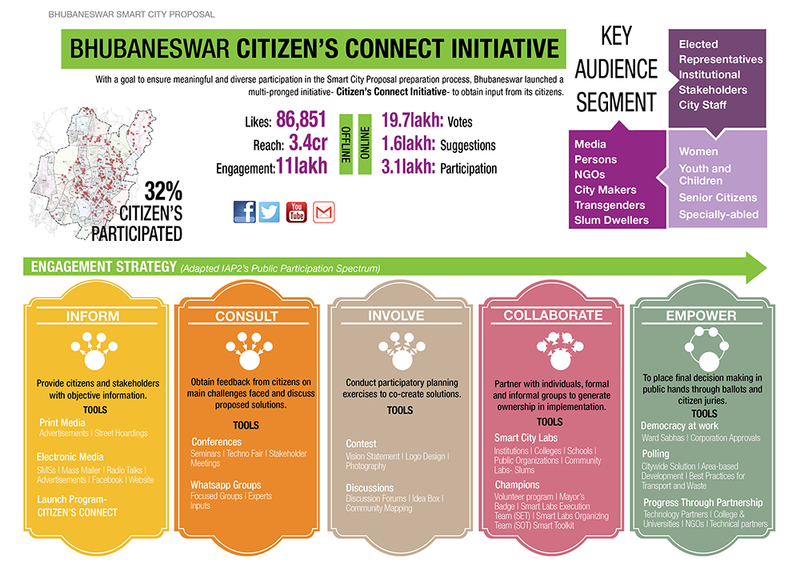 The Bhubaneswar Smart City Plan redefines the concept of "smart cities" and outlines a citizen-driven vision for the future by using technology to help residents gain better access to city services, and improve the overall quality of life. The goal was to engage residents in discussions to identify which groups had access to technology and city services and which groups did not, and how to close that gap. The plan provides a foundation for a more inclusive, resource-efficient and technology-enabled city. This is an online resource for planners and researchers seeking an interdisciplinary, annotated bibliography of the pertinent literature. This list highlights articles and publications from the American Planning Association and other experts in the field. New items will be added periodically so please revisit this page to see the most current ideas about Smart Cities and Sustainability. Articles from Planning magazine are available online to members of APA. Articles from JAPA, Zoning Practice, Planning & Environmental Law, and PAS Memo are available to those publications' subscribers in varying online formats. Any JAPA articles that appear in the bibliography contain an access link for subscribers who are also APA members. A white paper examining the impact of the APA's Smart Cities & Sustainability Initiative, covering how to involve the planning community, the pros and cons of smart cities, and challenges and opportunities going forward. American Planning Association. "Smart Cities Innovation Portal." Available at www.linkedin.com/grp/home?gid=8241104&trk=my_groups-tile-grp. A LinkedIn discussion group on smart cities and innovation. Members discuss and share articles featuring various aspects of technology and data in city planning and design. Evans-Crowley, Jennifer, and Joseph Kitchen. 2011. E-Government. Planning Advisory Service Report no. 564. Chicago: American Planning Association. Available at https://www.planning.org/publications/report/9026888/. This Planning Advisory Service report is part of an ongoing 10-year study of how planning departments are using web-based tools to improve their work and, in particular, how planners are using these tools to engage the public. This report provides information to planners about best practices in creating planning websites and incorporating web-based tools into their everyday work. Hammon, Mary. 2015. "FCC Okays Municipal Broadband." Planning. May. Available at www.planning.org/planning/2015/may/news.htm. This article explains the FCC's early 2015 decision to allow the cities of Chattanooga, Tennessee, and Wilson, North Carolina, to expand their municipally-run broadband services outside their territories. Hammon, Mary. 2015. "Data-Driven: Leveraging the Potential of Big Data for Planning." April. Planning. Available at www.planning.org/planning/2015/apr/datadriven.htm. This article discusses the role of big data in city planning and its potential to improve urban environments and the lives of citizens who live in them. Horwedel, Joseph. 2015. "Planning Office of the Future Task Force Report." Chicago: American Planning Association. Available at www.planning.org/leadership/agendas/2015/spr/pdf/PlanningOfficeFutureFinal.pdf. The Planning Office of the Future Task Force was created to report on planning management models and how technology is changing management and service provision. The report identifies and discusses four major trends that planning offices of the future will need to address: demographic change, technology as a disruptive force, 21st century problems with 20th century planning practices, and economics. McMahon, Kathleen, Ronald L. Thomas, and Charles Kaylor. 2012. Planning and Broadband: Infrastructure, Policy, and Sustainability. Planning Advisory Service Report no. 569. Chicago: American Planning Association. Available at https://www.planning.org/publications/report/9026893/. This report studies the forces and trends making high-speed broadband infrastructure an essential and necessary consideration in public planning at all levels, from area plans to urban comprehensive plans and especially to regional plans that address other infrastructure needs including transportation, water supply, sewer, and — increasingly — energy. Selin Davis, Lisa. 2015. "Cities by Consensus: Crowdsourcing and Crowdfunding Take Planning to a New Level." Planning. April. Available at www.planning.org/planning/2015/apr/citiesbyconsensus.htm. This article examines the potential and consequences of crowdsourcing and crowdfunding for planning and funding city planning projects. Bates, Katherine, Lara Malakoff, Stephen Kane, and Julia Pulidindi. 2012. "Closing the Digital Divide: Promoting Broadband Adoption Among Underserved Populations." ICF International/National League of Cities. Available at www.nlc.org/Documents/Find%20City%20Solutions/Research%20Innovation /Infrastructure/Closing_Digital_Divide_Promoting_Broadband_Adoption_Underserved _Populations.pdf. The National League of Cities has partnered with experts at ICF International to produce this white paper that looks at the challenges and benefits of broadband adoption. It also summarizes current efforts to address these challenges at the U.S. federal, state, and local levels, as well as in the private sector. Bozeman, Montana. 2014. "Bozeman Fiber Master Plan and Feasibility Study." Available at http://weblink.bozeman.net/WebLink8/0/doc/78575/Electronic.aspx. This study provides a series of strategies and activities to help get more and better broadband in the city of Bozeman, Montana and presents information that the city and stakeholders need to make an informed decision about strategic investments in modern broadband infrastructure. Campbell, Tim. 2012. Beyond Smart Cities: How Cities Network, Learn, and Innovate. London/Washington, D.C.: Earthscan. The promise of competitiveness and economic growth in so-called smart cities is widely advertised in Europe and the U.S. The promise is focused on global talent and knowledge economies and not on learning and innovation. But to really achieve smart cities — that is, to create the conditions of continuous learning and innovation — this book argues that there is a need to understand what is below the surface and to inspect the mechanisms which affect the way cities learn and then connect together. Carter, Philip, Bill Rojas, and Mayur Sahni. 2011. "Delivering Next-Generation Citizen Services: Accessing the Environmental, Social and Economic Impact of Intelligent X on Future Cities." IDC and Cisco. June. Available at www.cisco.com/web/strategy/docs/scc/whitepaper_cisco_scc_idc.pdf. This white paper from the International Data Corporation and Cisco discusses the more proactive role of technology in creating and delivering citizen services. This IDC White Paper will examine these issues, their impact on various stakeholders across the ecosystem, as well as how technology is evolving to help those stakeholders build the future city in a more sustainable fashion. The City of Portland, Oregon. 2011. "Connecting to Our Future: Portland's Broadband Strategic Plan." Available at www.portlandoregon.gov/revenue/article/394185. The strategic plan for broadband development in the city of Portland, Oregon. The plan creates an effective broadband policy that has the potential to create more jobs for Portlanders, increase opportunities for the region's companies, enhance public safety, and provide greater educational opportunities. Evans-Cowley, Jennifer. 2015. "Fitness Apps are the New Planning Tool." Planetizen. Available at www.planetizen.com/node/75515/fitness-apps-are-new-planning-tool. April 3. This post highlights two fitness apps, CycleTracks and Strava, in the cities of Portland and San Francisco, and what they reveal about those cities' infrastructure and possible use of fitness apps in planning. Federal Communications Commission. 2010. "Connecting America: The National Broadband Plan." March 17. Available at https://transition.fcc.gov/national-broadband-plan/national-broadband-plan.pdf. The Federal Communications Commission 2010 National Broadband Plan to ensure every American has "access to broadband capability." Federal Communications Commission. 2015. "2015 Broadband Progress Report." Available at www.fcc.gov/reports/2015-broadband-progress-report. The report finds while significant progress in broadband deployment has been made, due in part to the FCC's action to support broadband through its Universal Service programs, these advances are not occurring broadly enough or quickly enough. The report concludes that more work needs to be done by the private and public sectors to expand robust broadband to all Americans in a timely way. Hedlund, Kan. 2012. "Smart City 2020: Technology and Society in the Modern City." Microsoft Services. March. Available at www.microsoft.com/global/sv-se/offentlig-sektor/PublishingImages/Smart_city_2020.pdf. This paper presents the Microsoft point of view about the future of modern, smart cities in general and the city of Stockholm in particular. This roadmap is an intelligent guess about the evolution of city services and technology until the year 2020. It is intended to help people who deal with IT and business planning understand the roadmap of planned IT services in the city of Stockholm. Katz, Bruce, and Julie Wagner. 2014. "The Rise of Innovation Districts: A New Geography of Innovation in America." Brookings Institute. May. Available at www.brookings.edu/~/media/Programs/metro/Images/Innovation/InnovationDistricts1.pdf. This paper seeks to capture the emerging trend of innovation districts, explore the large forces and local practices and practitioners that are driving it, and provide initial guidance to U.S. city and metropolitan leaders on how best to recognize and extend the growth of their own innovation districts, building on the distinctive assets and potential of their economies. National Telecommunications and Information Agency, Economics and Statistics Administration. June 2013. "Exploring the Digital Nation: America's Emerging Online Experience." Available at www.ntia.doc.gov/files/ntia/publications/exploring_the_digital_nation_-_americas_emerging_online_experience.pdf. This report goes beyond new findings on computer and Internet adoption in the United States to also present data on Americans' online activities — what Americans do once they connect to the Internet. These findings about online activities, broadband adoption, and reasons some do not go online at home provide key factual underpinnings for the development of sound policies for increasing broadband adoption in the United States. Smart Cities Council. 2015. "Smart Cities Readiness Guide: The Planning Manual for Building Tomorrow's Cities Today." Available at http://smartcitiescouncil.com/resources/smart-cities-readiness-guide. The Smart Cities Readiness Guide is the first collaborative and comprehensive framework for a smart city, against which cities can assess their readiness to innovate — identifying a path, taking next steps and measuring their progress. The Guide is a conceptual roadmap to address growth strategies by focusing on universal principles that unite key areas such as energy, transportation, water, and public safety. Transit Cooperative Research Program. 2012. "Uses of Social Media in Public Transportation." Available at www.trb.org/Main/Blurbs/167067.aspx. This synthesis explores the use of social media among transit agencies and documents successful practices in the United States and Canada. Transit agencies have begun to adopt these networking tools to provide transit information as timely updates, public service, citizen engagement, employee recognition, and entertainment. Transportation for America. 2010. "Smart Mobility for a 21st Century America." Available at http://t4america.org/wp-content/uploads/2010/10/ITS-White-Paper-100710-FINAL.pdf. This white paper summarizes how establishing national targets for reducing congestion and emissions through programmatic changes and funding incentives can accelerate the development and implementation of innovative new information systems and technology solutions. This paper also explores strategies for using existing and emerging technologies to minimize congestion, reduce emissions, cut spending, create jobs, and improve efficiency, all while expanding convenience, safety and mobility. Townsend, Anthony M. 2013. Smart Cities: Big Data, Civic Hackers, and the Quest for a New Utopia. New York City: W.W. Norton & Company. In this era of mass urbanization and technological ubiquity, what happens when computers take over the city? Anthony Townsend explores this question in Smart Cities, a broad look at the people and historical forces that have transformed the design of cities and information technologies. As a new generation of technology barons, entrepreneurs, mayors, and civic coders try to shape our future, Smart Cities explores their motivations, aspirations, and shortcomings, offering a new civics for building communities: together, one click at a time. Institute for Sustainable Communities, Urban Sustainability Directors Network, and Nutter Consulting. 2015. "Getting Smart About Smart Cities." Available at https://drive.google.com/file/d/0B-Qyqs4CpZkoUWtGc0o2SjJ3WDg/view. This resource guide is an initial step in identifying shared challenges, opportunities, and promising practices in using smart city technologies and strategies that were discussed during the USDN Smart Cities Summit in August 2014. The guide also provides an initial knowledge base that will function as a working foundation for sustainability, innovation, and IT professionals as they delve deeper into the smart cities arena. The American National Standards Institute Network on Smart and Sustainable Cities is a forum for information sharing and coordination on voluntary standards, conformity assessment, and related activities for smart and sustainable cities in the U.S. and abroad. The network convenes via monthly webinars featuring guest speakers with discussion and open information sharing among all participants. The Benton Foundation is a private operating foundation that works to ensure that media and telecommunications serve the public interest and enhance our democracy through policy solutions and providing information resources. The Benton Foundation also provides free daily summaries of articles concerning the quickly-changing telecommunications policy landscape. The Blandin Foundation works to strengthen rural Minnesotan communities. The Blandin Community Broadband Program has engaged at local, state and federal levels to ignite and sustain policies that support rural access to robust broadband. Code for America is a nonprofit dedicated to creating and deploying open-source software for local governments and organizes a network of people dedicated to making government services simple, effective, and easy to use. Envision Charlotte is a charitable organization dedicated to the improvement of the city of Charlotte, North Carolina, through environmental sustainability combined with a pro-business approach. This is achieved through perpetual, formal stewardship of defined resources in the environment in the areas of energy, water, air, and waste. IBM Smarter Cities is an initiative of IBM Smarter Planet, created to provide hardware, middleware, software, and service solutions for city governments and agencies. The solutions implement existing IBM technology such as IBM cloud computing, analytics, mobility, and social business. The Institute of Electrical and Electronics Engineers Smart Cities is an initiative of the IEEE dedicated to assisting municipalities with the transition into more intelligent, sustainable urbanized environments by organizing local events in targeted cities with international experts in the specific areas of focus. The Intelligent Community Forum is a global network of cities and regions with a think tank at its center. Its mission is to help communities use information and communications technology to create inclusive prosperity, tackle social and governance challenges, and enrich their quality of life. The ICF think tank studies how Intelligent Communities use ICT to succeed in the broadband economy and from that evidence-based research offers unique guidance through reports, books, live and online educational programs, and conferences. The ITU Focus Group on Smart Sustainable Cities acts as an open platform for smart-city stakeholders to exchange knowledge in the interest of identifying the standardized frameworks needed to support the integration of ICT services in smart cities. The City Science Initiative at the MIT Media Lab is a unique network of research groups experienced in the design of technology and infrastructure, the analysis of big data, and the development of rigorous scientific theories. The City Science Initiative at the MIT Media Lab provides an interdisciplinary nexus where these research networks join to improve the design, livability, and understanding of high performance urban environments. SENSEable City Laboratory is a research initiative at the Massachusetts Institute of Technology that uses the increased deployment of sensors and hand-held electronics to show how we describe, understand, and design cities and their physical structure. Pew Research Center is a nonpartisan fact tank that informs the public about the issues, attitudes and trends shaping America and the world. Pew conducts public opinion polling, demographic research, content analysis, and other data-driven social science research. Pew Research Center Internet, Science & Tech focuses on the trends and issues in the areas of science, internet, and technology. The Smart Cities Council is a coalition of leading companies that seeks to advance the livability, workability, and sustainability of the world's cities through advocacy and action. The U.S. DOT's ITS program focuses on intelligent vehicles, intelligent infrastructure, and the creation of an intelligent transportation system through integration with and between these two components. The federal ITS program supports the overall advancement of ITS through investments in major research initiatives, exploratory studies, and a deployment support program including technology transfer and training. The Sustainable Practices Science branch of the EPA provides resources from across a wide spectrum of investigative fields working together to form a deeper understanding of the balance between the three pillars of sustainability — environment, society, and economy. The U.S. Green Building Council is a council dedicated to the promotion of better green buildings and a sustainable built environment through the LEED certification program, education, advocacy and local chapters. Data.gov is a federal open government data site that aggregates government data and makes it available in open, machine-readable formats. The Cities section collects civic open data and makes possible the discovery of data and apps that are creating new ways to explore cities, services, and information. Broadband Communities focuses on digital and broadband technologies for buildings and communities. BC offers in-depth news, expert insights, and practical know-how on the technical, business, financial, and legal aspects of outfitting properties and communities with broadband solutions. Government Technology covers information technology's role in state and local governments. Through in-depth coverage of IT case studies, emerging technologies, and the implications of digital technology on the policies and management of public sector organizations, Government Technology chronicles the dynamics of governing in the information age.